The end of dry season. The GTCA hopes you will plan on joining us for our big events around Homecoming 2009 on October 17th! Please fill out this survey to help us plan that weekend! Ah, the end of dry season. We are quite certain there was some excitement in the team's hotel this past weekend once the races were over! As usual, the weekend provided us with plenty of excitement and chaos - always with interesting weather and of course, lots of fun. In this newsletter we'll give you the team results and also share with you our experiences in the GTCA tent on the riverside! We think it was a great success and can't wait to do it again next year! After this newsletter, we are moving to a monthly newsletter during the summer. We hope that you will stay in touch with us via our website and prepare for our fall events! The next GTCA meeting will be Monday, May 18, 2009 at 6:30pm. College of Management building, classroom 101. All are welcome to attend. Through Summer 2009, the GTCA board will meet every 3 weeks. We will resume meeting every other week in the fall. You can see all of our meeting minutes here. What is a Dad Vail Regatta without a little excitement... both on and off the water. This year's event gave us a few confusing moments but over all, it was still a great time! See the pictures from the event. Starting Friday, due to the excess of rain this past week, the river had a lot of debris floating around which then caused an issue with laying out the lanes. Therefore, for the heats, the officials decided to send the boats down in time trials - very much like a head race - on 10 second centers. Although this made for a somewhat boring day of racing for the Alumni, the official spectating tent was still set up with food and drinks and we enjoyed the day by the water with good friends. On Friday night after the heats (in which Georgia Tech had 10 boats racing), the first inaugural team-alumni dinner and clean plate club meeting was held at the Spaghetti Warehouse. 100 alumni, parents and rowers attended and it was a great evening of celebration for Georgia Tech. 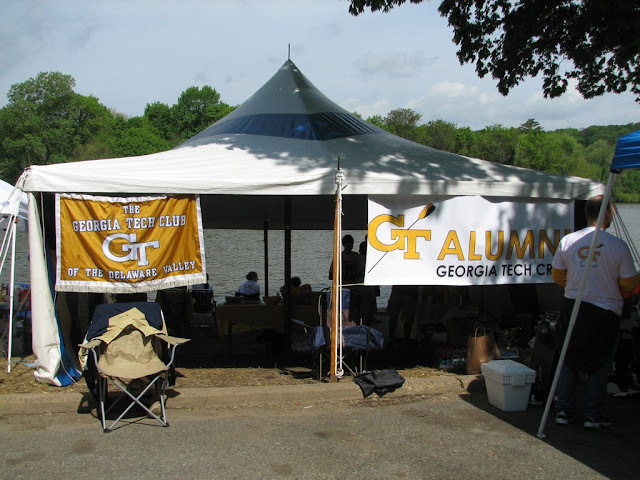 Under the tent on Saturday we had loads of free food and beverage provided for alumni, parents and rowers of GT Crew! The 20' x 30' tent was co hosted by the GTCA and the local Delaware Valley / Philadelphia GT Alumni Club and a big thanks goes out to them for all their help with food and drinks. With the additional support of the Alumni Association, and the Georgia Tech Division of Student Affairs, alumni and friends from all over the country were able to enjoy a beautiful day on the river. And, believe it or not, it didn't rain at all. Read about the full race results in the Team Updates section. We hope to see you at Dad Vails in 2010. And don't forget to visit our pictures page to see more familiar faces. The GTCA would like to give a special thanks to Delaware Valley/Philadelphia GT Alumni President Jim Craven and GT Crew Friend Jenny Yusin for all the help and support they gave the GTCA this past weekend. We really appreciate it! Keep your eyes on our newsletter and website as we announce upcoming events for the GTCA. As we start the summer planning the Fall season, we'd like to hear from you. If you could take a few minutes and fill out this QUICK SURVEY, we would be very grateful! Thank you! Last newsletter we stated that it was wedding season! Well, the announcements have come flooding in... here's another one! Congratulations to Kimberly Cooper, who rowed 2002-2004. She is getting married on September 12th to Chris Bryce! Also, some of our old teammates are moving around! This month, long time rower and coach Steve Georgalis will be moving to New York City with his wife Veronica! They are looking to sell OR RENT their awesome two bedroom loft in Midtown Atlanta. Check out their beautiful photos on their website. The rent price is not listed online yet but will be $1500/month. In addition to selling their condo, they are also trying to sell their car! Who needs a car in NYC? It is a 1996 Black Volvo 850 with 200k miles, brand new front and rear brake pads and calipers. There was only one owner the entire time, and the only thing wrong is a crack in the windshield. Steve is offering a GT Crew friendly discount at $2500. Please contact Steve through his website if you're interested. If you or anyone else is moving, getting married or doing something just as exciting, please fill out our form! Don't forget to get your inaugural t-shirt before the summer! They are available to anyone who wants to become a founding member of the Affinity Group! They looked great on the side of the river at the races this weekend! Find out more. In addition, we have added bumper stickers to our merchandise! FINALLY - real bumper stickers that look just like the image to the right! Get yours today by checking out our merchandise shop!